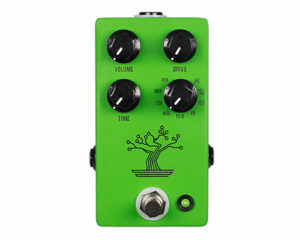 Following in the steps of the our Muffuletta (released 2015), the Bonsai utilizes a simple rotary knob to switch through nine classic, vintage, rare, or hard to find variations of the Screamer. Creating the Bonsai became an archeological dig of sorts that sent us deep into the history of this circuit by examining dozens of versions, variations and replications. At the end of it all, Josh chose nine of his personal and favorite units and we painstakingly replicated every nuance and aspect of each pedal. One of the most challenging parts of this project was accounting for component drift as many of these pedals were decades old and the internal components had strayed from their original values. Each pedal was individually replicated using our Audio Precision analyzer and various other methods that allowed us to perfectly replicate every aspect of the sound and feel of the unit. It’s important to know that the Bonsai is not a “box of mods,” it is exact replications of these nine units all house in one box! The Bonsai is exact replication, not emulation. When you choose a mode on the Bonsai rotary, you are actually activating components specific to each mode and playing the unit that Josh choose along with all the quirks, drift, vintage mojo, and individuality that a vintage pedal has.